This program is perfect for the 2018 Collaborative Summer Reading Program's theme "Libraries Rock"! Magician Debbie O'Carroll joins Musician Tom O'Carroll in fun and funny interactive magic show that highlights the art of music. Tom's lively songs and tunes on the guitar, banjo, tin whistle, mandolin, Irish drum and African thumb piano will introduce youngsters to music from Scotland, Spain, East Africa, Ireland, Italy and the U.S. Debbie's enchanting magic illusions will involve all with some storybook characters from these magical and musical lands. Children love trains and magic shows! This innovative program for ages 3 to 10 features participatory stage magic, zany comedy and a map of the United States. The audience will imagine themselves visiting some famous sights and attractions in Massachusetts, New York, Florida, Georgia, Texas, Colorado, Kentucky and Wisconsin. Hop on Debbie's amazing magical train and join in the fun! This performance blends lyrical stage magic with Irish music, as Debbie joins her Irish-born husband, folk singer, Tom O'Carroll, on stage. Audiences will learn about Irish history, language and social customs as they participate in the exciting and entertaining music and magic of Ireland. This program is perfect for grades K through 8, family audiences and fund raisers. This show is a zany magic show about a day in the life of a honeybee. Debbie uses stage magic, comedy and theatre to acquaint children ages 4 to 12 with the social structure of a honeybee colony. Debbie will portray the different jobs that worker bees do to keep the hive running smoothly. The Flower Power Magic Show is a fun way to learn about the fragile ecology of honeybees. Magician Debbie O'Carroll's magic hat is on the fritz! Where in the world can she find a new one? Will she choose a wizard's hat from England, a sorcerer's turban from India, a conjurer's cap from China, a genie's fez from Turkey, a fairy godmother's hood from France, a seanachie's tam from Ireland, or a sprite's headdress from Ghana? Ages 4 to 11 will delight in this magical quest around the globe. Full of amazing stage magic, lively physical comedy, and creative audience participation, The Small World Magic Show is a wonderful way to learn about world geography. Because our knowledge of our solar system is constantly growing and changing, The Planets Magic Showkeeps current with each new discovery! Pluto "retired", but gained two new moons. Water was found on Mars and five dwarf planets have joined the classical planets. 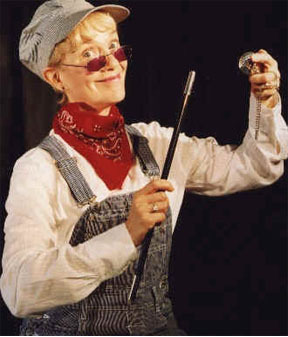 Debbie plays the role of each planet and uses amazing stage magic, innovative theatre and lively comedy to intrigue and delight audiences ages 4 to 10 with our fascinating planets. This show combines stage magic, physical comedy and tap dancing with lots of audience participation to make this show perfect for young Halloween revelers ages 3 to 9. The audience will imagine themselves at a ghostly tea party and pretend to trick or treat at a haunted house. They will help design a magical costume, make sound effects for a silly nightmare, solve the mystery of a vanishing monster, and more. Debbie's favorite magic wand is missing! Young readers are invited to join Debbie in this lively celebration of American history and stage magic as she imagines herself going back in time to ask some of our founding mothers to help her solve the mystery. The audience will meet Sybil Ludington, the female Paul Revere; Mary Pickersgill, the maker of the Star Spangled Banner; Dolley Madison, our fourth first lady and Mrs. John Brenon, the first woman stage magician in the U.S. They will also share the magic of the biographies of Sacagawea, Molly Pitcher and Phillis Wheatley. For a special performance of "The Yankee Doodle Magic Show", folk singer and musician, Tom O'Carroll will accompany Debbie with American tunes on the banjo and guitar and invite the audience to sing along with some old time favorites. An exciting and colorful program that will captivate children ages 4 to 12 with mystifying stage magic, lively comedy and enchanting lore. The audience will actively participate in Debbie's merry celebrations of Christmas, Hanukkah, Las Posadas, The First Day of Winter, Dewali, New Year's Eve, Bodhi Day, St. Stephen's Day, Three King's Day, Kwanzaa and more as they learn about the different holidays that light up this special month. The Christmas Magic Show and an The Irish Christmas Magic Show are is also available. For an especially festive program, folksinger Tom O'Carroll will add some favorite holiday sing-along songs to this show! Learn about fitness through the art of stage magic. This fun-filled program is perfect for ages 4 to 12 and it reinforces the idea that exercise is good for you. Debbie's lively participatory magic show highlights the physical benefits of playground games, organized sports, dance and healthy nutrition. Those on a budget may like to book Yoga Cadabra, a combination magic show and yoga class that introduces children to this ancient form of healthy exercise! 1) Magician Debbie O'Carroll performs a traditional, funtime magic show. 2) The Fairy Grandmother's Magic Show features enchanting fairytale magic. 3) The Topsy Turvy Tea Party echoes the madcap world of Alice in Wonderland. 4) The Silly Monster Magic Show captivates all with playful monster themed magic. 5) Celebrate the Holidays with The Fairy Grandmother sparkles with merry celebrations of Christmas, Hanukkah, Kwanzaa and more. 6) The Around The World Magic Show with The Fairy Grandmother introduces languages, customs and cultures of people around the globe. 7) Tea with SeanmhÃ¡thair Sidhe is full of fun with the Irish Fairy Grandmother.